As mentioned, we ran up Cricket Hill not once but twice - once at the beginning and once at the end. 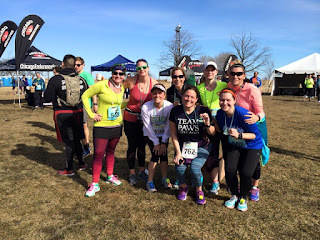 Last year I ran the race while training for the Wisconsin Half Marathon. And my pace of just under a 10 min mile was right where I wanted to be (even if that didn't pan out during my half, but that's another story). This year I'm not really 'training' for anything. I might run the Cleveland Half Marathon. I didn't really have a goal pace, just to go out and run. Last year I ran with a friend from marathon training. 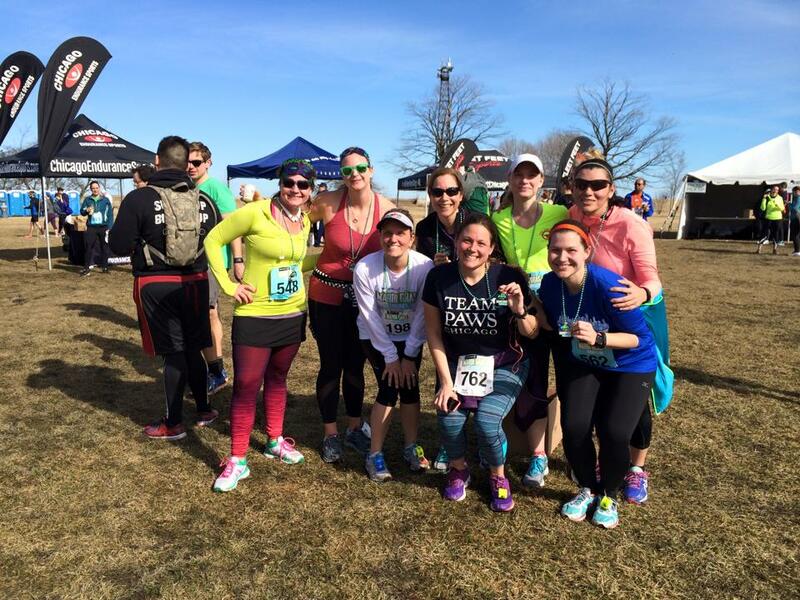 This year I ran with multiple friends from marathon training. One of the said friends had just had a birthday, and we made a sign and posted it along the course. We missed it on the way out, but on the way back in we saw it and it was totally fun to go by and say happy birthday to her in the middle of a race. The second time up Cricket Hill, 9+ miles into a race isn't fun. It nearly killed me. Despite that, I took more than a minute off my 10 mile PR so YEAH for me. I did make a mistake of wearing my jacket on the run, so even though I had a short-sleeved shirt on underneath, I ended up being hot the last few miles. I won't bore you the details of each mile. We kept a pretty steady pace of around 9:45. We had a few faster miles and one 10 min. slow mile. Amazingly, even with the hill, my last mile was a 9 - so that makes me feel good. In the end, I ran a 1:37:05, 9:43 pace, which put me in 31/78 in my division; 328/652 women; and 809/1265 overall. Right there in the middle, just where I like to be. But this means that (a) I should be able to run a 10 minute pace if not faster half marathon - but why can't I seem to do that? And (b) that I really should start doing more weight and speed training. I need a coach - even a virtual coach. It was a fun race, I saw lots of friends, I earned another medal and shirt and spent a couple of hours outside on Saturday morning. What could be better? Next up - Shamrock Shuffle (?) 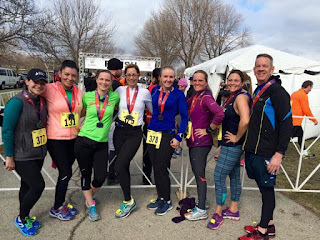 Chi-Town Half (?) - Both questions marks because I have signed up for neither. Here I am at the beginning of the year trying to keep my running going. It's hard to get in 25-30 miles a week during the winter. And the funny thing is I think I'm probably doing better than I was last year - I am definitely faster. Or I feel faster. But I have been fighting a cold for so long and I somehow made it through the F3 Lake Half Marathon (which I never got around to writing about because (a) I had a crappy run and (b) what else can I say about a run that I've done for three years in a row other than it was fun.) I'm glad I did it because it keeps me running and I have a great support group of friends that even if it's a crappy run I have fun anyway. After that I tried to get back into a regular schedule for a couple of weeks, but couldn't. Then I took 11 days off . I didn't mean to take 11 days. I had thought about running several times but we had a really, really, really cold snap that kept pretty much everyone inside and even though I told myself I was going to run at my office gym a couple of times, by the time I was able to go to the gym, I didn't want to be in my office building anymore so I would leave. But, at least I got rid of whatever bug seemed to be floating around my system. Sometimes you need to take some time off. 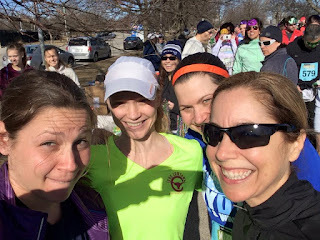 On Saturday, Feb 20, instead of running with the marathon training group, which I had been doing with the thought I might do the Cleveland Marathon (to be decided), and doing 13 miles, I ran with the half marathon training group for its first run, which was just 4 miles. 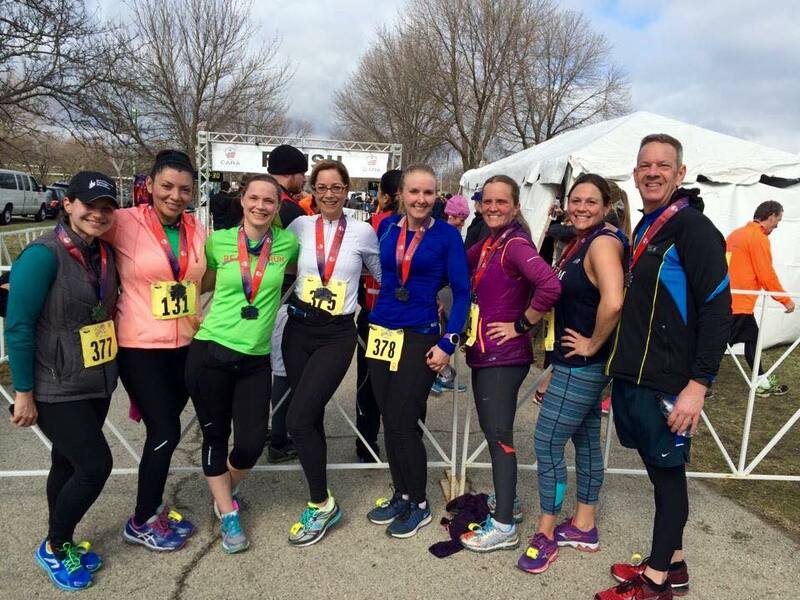 And then several of us, after a stop at Starbucks, ran Back on My Feet Chicago's Mardi Gras Chaser 5k/10k. Since I ran the 10k, I kinda got close to 13 miles. During our training/warm up run, I joked that either we were going to run a really good race and PR or we were all going to crash and burn. Most of us did the former. I, somehow managed to do both. Technically I'm not sure I PR'd because none of us have the course going the full distance. All of our Garmin's said we were shy of the 6.2 miles by almost .2. But according to the race, we all ran that distance and at a pretty quick pace. And even if we didn't run the full 6.2, we still PR'd at 6 miles plus a tiny bit. Now maybe a venti latte at Starbucks wasn't the best choice. But we had almost 2 hours between our training run and the race, and I'm so used to ordering a large coffee. After the Starbucks stop, we made our way to Montrose and stood in the pretty long, but fairly fast moving port-a-potty line. Despite emptying my bladder fully minutes before the race, I had to go pretty badly directly after the race. All smiles on a sunny February day. Once through the port-a-potty line, we got into the corral and took a selfie while waiting for the start signal. Our plan was to run 9:30s. That's what we run on Monday/Wednesday mornings for our almost 5 miles (I'm noticing a trend where we don't run quite even distances, I wonder what that is about), so we figured we could hack that for 6. 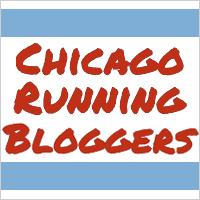 Mile 1: 9:26 They split the 10k into two waves, I guess so 200 people didn't hit the lakefront path at the same time. Being in the second wave, we had to do a little weaving in and out of people. But overall, an easy mile, and we stayed together. The only hiccup was right at the start when my hat flew off. Mile 2: 9:12 This is where we start to see a discrepancy in the distance as our watches all 'dinged' the lap about a tenth of a mile past the mile marker. Despite our intentions to hold a 9:30, clearly we sped up. Laura promised to stop pacing herself with the two women with flowers in their hair that were right in front of us as they didn't' seem to be in on the 9:30 pace thing. We decided to slow down a bit. Mile 3: 9:10 Did I say slow down? I meant speed up a bit. At this point I believe one of our group had dropped back a bit, and despite my intentions of keeping with my friends, I wasn't going to be able to hold a sub 9:30 pace. This time, I actually slowed down. Mile 4: 9:33 I happily (sorta) let my friends go. I knew that there was a chance, given the size of this race and having looked at the results from last year, that we'd all finish pretty high in our age groups. I don't know if the knowledge made me push myself, or let me off the hook. My legs weren't feeling too bad, but my lungs were starting to burn. Even though I was over my cold, I think I was still recovering. I walked through the water stop, giving myself a few seconds to cool down and set off with the intention of at least not letting my friends out of my sight. Mile 5: 10:00 You really can't make on the fly decisions during a race. With my friends basically out of site, I considered quitting and walking the rest of the way. I have this thought pretty much every time I race. At what point do you stop questioning why you put yourself through this? Probably never, at least for me. Regardless, I didn't quit. And since I took an extended walk through the water stop and did that thing where you tell yourself you're just going to run to the next half mile marker, the next water stop, the next tree, I'm pretty impressed that I only clocked a 10 minute mile. Mile 6: 9:33 One can always make oneself go faster that last mile - usually. Not only did I pick up the pace, but actually sprinted quite hard at the end. There was a lady behind me who was talking her friend through the end of the race with affirmations like "we got this" and "we're not stopping". We did, and we didn't. Finishing pace 9:30 on the nose. See, even though three of my friends ran faster than our goal pace, true to my word, I finished with a 9:30 pace! I finished 6th in my age group out of 22; 56/168 for women; and 120/270 overall. This race was a lot of fun. We got cute medals hung on Mardi Gras beads. There was lots of food and I hear the after party at Fat Cat was a pretty good time. But best of all, this race was for a good cause. There were lots of Back on My Feet clients running and walking the events, which is great to see. Next up, the CARA Lakefront 10 Miler. But first, a 15 mile run this weekend. If all goes well, and I'm feeling good afterwards, I will sign up for the Cleveland Marathon (maybe).